What is Elliott Wave Theory? Wave analysis is a very popular form of technical analysis that can be applied to stock charts to forecast the future direction of prices....but what IS the Wave Theory and what can it do for you and me? An ability to recognize where any market is in a cycle at a given point in time can help to pinpoint high probability trade entries and exits, thus reducing the frequency of any losing trades and allowing the trader to run positions for longer so as to maximize profits from every trade. Brought into the mainstream in the 1970s by Frost and Robert Prechter through the publication of their best seller, Elliott Wave Principle and successful application of the Wave theory can substantially improve a traders profitability. The beauty of it is that it can be used to help forecast future prices when trading in any market whether your interest is in trading Forex, Stocks, Commodities such as Gold and Crude, Indexes or Bonds. 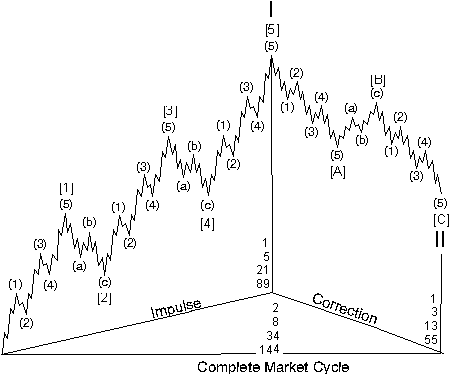 The image on the left shows a complete cycle but how do you recognize which wave the market is in at any given point? 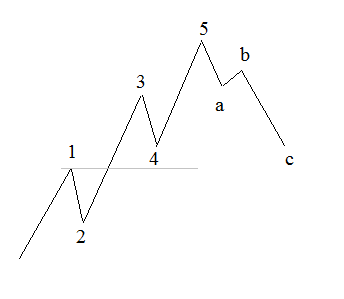 You do not need to be an expert Elliottwave theorist to benefit from using the wave theory, as even by gaining an understanding of the wave patterns will prove itself to be time well spent as you will soon start to see your stock charts in a whole new light and it will very quickly be reflected in the bottom line of your trading results. Start here to Learn Elliott Wave Theory basics where you will learn the basics of wave formation, the variations on the wave patterns. Learn how to recognize where the market is in its current cycle and forecast the future direction of prices. Learn all you need to know about applying Elliottwave patterns profitably with this Free online edition of Frost and Prechters Elliott Wave Principle. It is one of the all time best sellers for technical traders and you can be reading the 248 pages of this classic investment analysis manual in minutes. This complimentary online edition of Elliott Wave Principle, has recently been released by Robert Prechter and EWI. Elliott Wave Principle: Find out how to access Robert Prechters best seller online for free. Prechter's best seller will help you learn the 13 Elliottwave patterns that can occur in the charts of the financial markets along with the basics of counting waves, and the simple rules and guidelines that will help you to apply Elliottwave analysis for yourself. 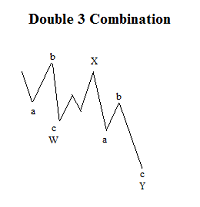 Wave patterns analysis today is used by traders and investors of all levels within the spectrum of the markets. From the small private investor who is trading forex from his spare room, to the managers of multi billion dollar investment funds. As with all Technical Analysis, one of the major benefits of applying Elliott Wave Theory to our stock charts analysis is that it can be applied equally as well at an intraday level as it can be applied to a multi decade stock chart. I doubt that any fund manager these days would make any investment decisions without first considering where the market could be within an Elliottwave cycle, even if only in its basic form. Fibonacci Sequence - Learn the basics of Fibonacci trading. Find out how the Fibonacci sequence works hand in glove with Elliott Wave theory to form a combination of technical indicators that provides us with an extremely powerful trading tool.